Mike Rowley, the ROTC/JROTC Awards Chairman of the Iowa Society of the Sons of the American Revolution reports that The Iowa Society has completed another year of 100% participation from all the ROTC/JROTC programs in the entire State of Iowa. Attached photos are from the Iowa State University Navy ROTC awards banquet held April 14, 2017. 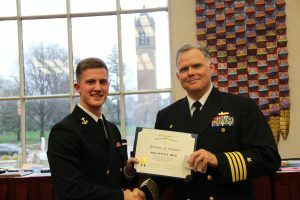 The recipient is MIDN 3/C Quinton G. Schnier and the presenter is CAPT Scott Curtis, the commanding officer of the NROTC unit at Iowa State University. photo by Capt Suzanne Mulet.